The story of Super Mario Party (yes, you heard this correct, this has a story) revolves around a mild-natured argument between the Mushroom Kingdom residents as to who is the kingdom’s Super Star. Ever the pragmatic fellow, Mario suggests that they have a Party to decide who will take this mantle, and thus continues the noble tradition of Mario and company going out of their way to make each other’s lives a misery. It’s at this point the player, or players, jump in and enter the sizeable Plaza in which their possible demise might occur. Greeted by a Toad, who will explain the basics and if you’re playing on your own, you will be allowed to pick a group of AI to play with that are grouped by difficulty to play against (Normal, Hard, Very Hard). Once you select this group (or once you have a group of four in real life), you can get started. Then the player can essentially pick their poison. You have the classic Mario Party, then River Survival, Sound Stage, Partner Party, Toad’s Rec Room, and finally a mode to just play Minigames alone. Each of these have varied rules, have different roles for the players, and often have a markedly different win criteria. Also, they vary quite greatly in terms of levels of camaraderie versus straight up hatred, both of which are immensely fun. 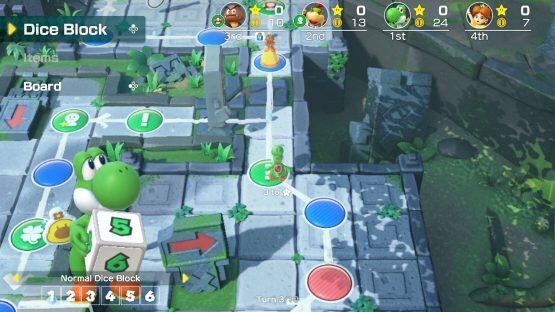 Mario Party mode is your classic board game mode, placing all of the players on a board with dice rolls, hazards, Stars to acquire and a heavy dollop of malice thrown in. The idea is to have the most Stars by the time the game ends, and how are these gained? By any means necessary. In play, they can be found on the board by paying the Toadette that randomly floats around, from Golden Blocks, or by stealing them from other players. It’s in that last one that true malicious intent starts to come through. The game will always begin nicely, but very quickly descends into vindictiveness as the Stars start to appear. In Super Mario Party, each player moves independently around the board, each rolling a die to determine that progress. 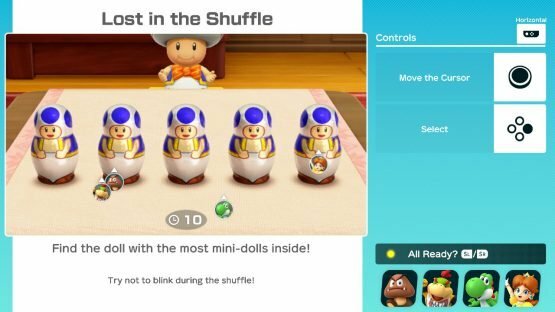 Interestingly in Super Mario Party, each player has the choice of two dice depending on their character choice. These can be massively to their advantage, such as having a more consistent die so almost guaranteeing a certain number, or to their detriment with the loss of coins occurring. This creates a sort of feeling of tense strategy as the player tries to deal not only with the other players but also with the hazards the board throws at them. Do you intentionally throw a low number to land on a particular space or gun for a higher number to get that Star? The hazards I mentioned before are plentiful, ranging from alterations to the board itself, or events that will damage the players in radius causing them to lose coins, like the King Bob-Omb exploding. Then there’s the Ally system that will see another character join you for the rest of the game (or for a short time) during which they can randomly increase or decrease your rolls. This is a lot of fun, and adds to the manic nature of the game, and is a wonderful addition that makes the whole game feel like one big party. Finally for Mario Party there’s the last mechanic to throw a spanner in the works; the items. Landing on certain spaces will allow the purchase of, or gain of through slot machine, items that can be used to help the player or hinder the other players. The best one I found was the Golden Pipe, which places you just before the Star, wherever it is on the board. This is the flagship mode, and with good reason. You can choose how long you want the game to be based on the number of overall turns, and having a mini-game at the end of each turn is the perfect way to shake up everything constantly. Also, with the minigames varying between 4-on-4, 2-on-2, and 3-on-1, sometimes you might have to swallow your joyously intense dislike to temporarily work together. Partner Party is a new mode added for this title that pits the players against each other in a 2-on-2 battle of challenges. In this mode, you team up with another player and roll together, then are given free rein to move anywhere on the grid-based board. The players have to team up to get enough coins to be able to buy a Star. You can earn coins by collecting them on the board, winning the minigames, or by (you guessed it) stealing them from the other team by stomping on them. 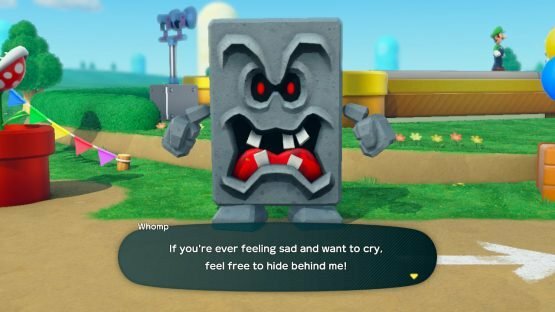 This is a really fun mode, taking various Mario Party elements and splicing them together to create an entirely new entity. River Survival (pictured above) is possibly my favourite mode in the whole game, putting all four players into a single raft that they have to all co-operatively row to the end of the course, completing co-operative minigames to earn more time, and occasionally swinging your Joy-Cons to activate four-player high fives. 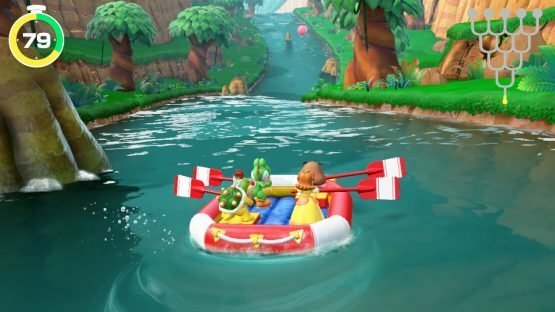 This is simultaneously the most wholesome mode and one of the most rage-inducing, with the high fives causing constant grins and yet if your “friends” fail to steer the raft right, you just want them to swallow the Joy-Con. I’m fine, really. Toad’s Rec Room is possibly the most interesting addition to the game, throwing into the mix a lot of variety in terms of how to play. The majority of these games are played in the Tabletop Mode, and are definitely the more Switch-specific and interesting mini-games. A personal highlight is the ‘Banana, Split’ mini-game that has you placing two Switch consoles face up and swiping across both consoles when you have lined up bananas. It’s hilarious, and is an utterly ridiculous use of the consoles. The Sound Stage mode is one for those that love rhythm action, with the HD Rumble feature of your Joy-Cons taking centre stage (sorry). 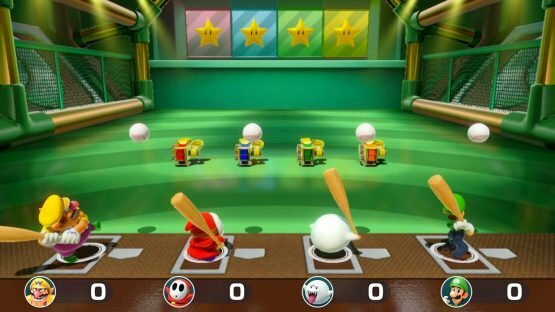 In this mode, the players take on eachother in a variety of minigames all revolving around timing, including hitting baseballs (see above) and taking part in a majorette parade. You definitely need to pay attention for these because the timing is unbelievably precise, but this mode is definitely a great addition to an already solid package. The Minigames area is exactly what it says on the tin, allowing the players to play any minigames they have already unlocked in the game in a quick shot arena. This is possibly the best mode if you only have a small amount of time, allowing pretty much instant fun with none of the commitment to finishing a board or a white-water rafting trip. Also, it’s a good way to get better at the minigames themselves, if you’re feeling particularly bitter about losing in another mode. Furthermore, even in this mode there are different ways to play the minigames, including the incredible ‘Square Off’ in which the players fight for territory by winning the games. Whilst mentioning minigames, there’s great addition to Super Mario Party of the ability to go online to play these too, so if you want to become the #1 ranked champion in the minigames, you can! Then finally there’s the Plaza itself, that has little fun things to find. Not only are there warp pipes to be unlocked around the area, one of which leads to Toad’s Rec Room (see above), but also you can find the ‘Events’ board and various heroes and villains from the Mushroom Kingdom standing around that can be spoken to, often with some fantastic or heart-warming results (such as Whomp, pictured above, which is adorable). Really, it feels odd to say this, but Super Mario Party is incredibly robust with content. There are just so many modes and ways to play, that this is really the definitive Mario Party game, maybe even having the highest longevity of any party game of any description. The options for co-operative and competitive play are unbelievably welcome, giving the choice to the players as to whether they want a more tranquil or hectic session; also, as every mini game has a tutorial (see below), everyone can learn to play at their own pace. In terms of aesthetic as well, Super Mario Party is unbelievably polished. All of the characters are beautifully rendered, the boards are imaginative and visually arresting, and all of the modes and menus are clear and bright. As is often the case with Nintendo products too, the sound design is absolutely incredible, brimming with familiarity but never encroaching on the repetitive. This isn’t only a joy (at times) to play, but an absolute joy to behold too. 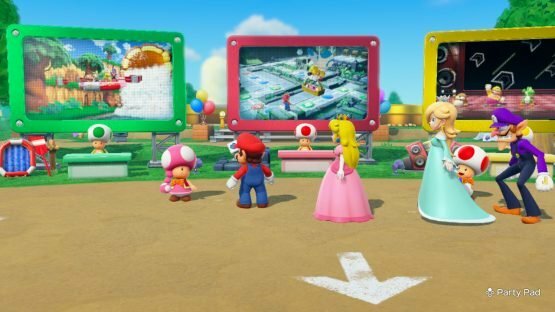 Super Mario Party is an honest return-to-form for the series, and a fantastic example of just how flexible the technology in the Switch and its various peripherals actually is in practice. All of the imagination that has gone into the games, the setting and the presentation just cannot be ignored just because this is essentially a party game. If you own a Switch, and regularly play games with others, you owe this game to yourselves. Also, this game gains points solely based on how much of a monster I become while playing. Here’s to ruining friendships!